Maksteel Wire Healds today stands firmly on two pillars: a commitment to match global standards in quality, with an unwavering emphasis on service. With an increasing client list worldwide, Maksteel Wire Healds is firmly positioned for growth and is able to offer a strong partnership to every stake holder. Thanks to all clients and colleagues, Maksteel Wire Healds is shaping a new dynamics. Maksteel Wire Healds Pvt. Ltd. established in 1980 is a leading textile weaving machine accessories manufacturer in India. Maksteel has made rapid progress in the area of Jacquard Harness and Parts for all types of Jacquard looms like Rapier, Air jet and Water jet. 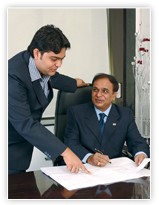 The company successfully supplies its products in India and other 22 countries.